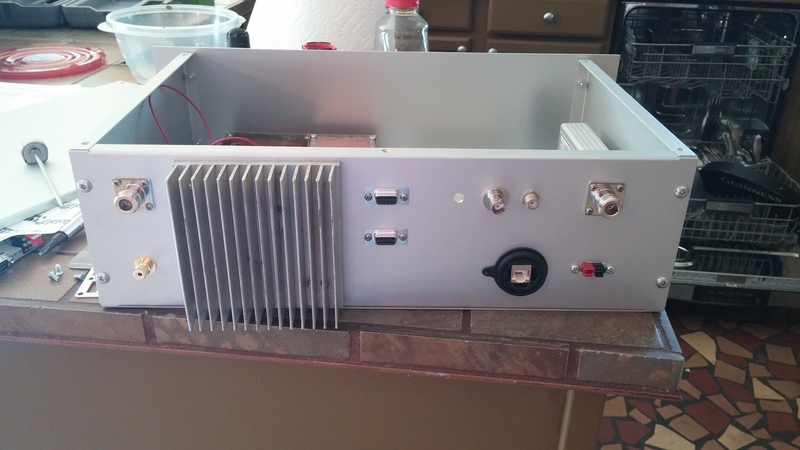 April | 2014 | Florida Simulcast Group, Inc.
Much progress has been made on building the main 224.280 MHz repeater. 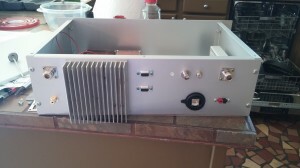 The rack mount case has been constructed and fixed to the Hamtronics modules, and the GPSDO master 10mhz clock source has been integrated with the units. This consists of a PIC 16f88 micro-controller running code that will spit out the appropriate bits to the CPU as it goes into transmit. The first revision of this code simply would power up, program the PLL IC and then shut down (no CPU noise). This worked but it had the effect of running the PLL VCO at 224.280 all the time transmitting a low level (-24dBm) signal at all times. This is enough to open the squelch of a radio about 2 blocks away. We solved this by making the PLL move off frequency when not keyed. When the repeater keys up, it now moves onto frequency in about 10ms and works flawlessly. 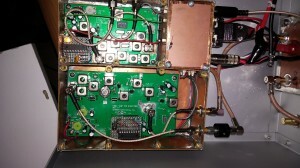 The other major issue was microphonics due to the cheap chip caps used in the VCO circuit of the hamtronics exciter. Cheap ceramic capacitors can be piezoelectric, and vibrations will cause them to vary (very slightly) in capacitance. A simple taping on the box will cause the frequency to swing 10-20 khz, which is unacceptable. The suspect capacitors were changed to mica insulated units which do not have such a problem. 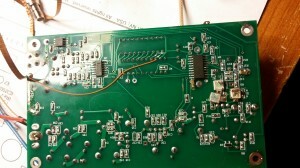 Between this and the potting of the VCO coil, almost all microphonics have been eliminated from the hamtronics exciter. 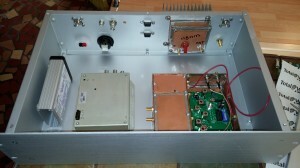 A stiff rapping on the enclosure now only varies the frequency a few Hz. This entry was posted in Uncategorized on April 10, 2014 by bryan.